The “gross” revenues are now nearly $7 billion per quarter. 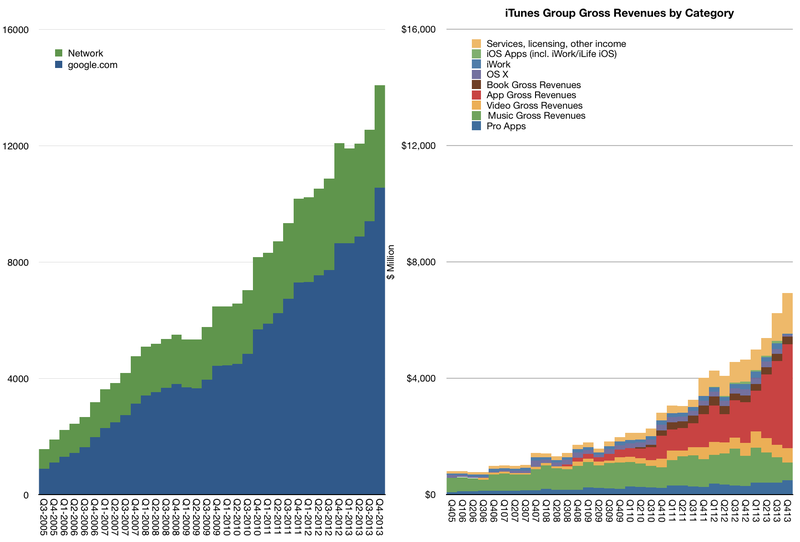 On a yearly basis the iTunes/Software/Services group had gross revenues of $23.5 billion with growth of 34% y/y. – Third party content +46.6%. The iTunes “empire” of content and services would be ranked as number 130 in the Fortune 500 ranking of companies (slightly below Alcoa and above Eli Lilly). […] reasons for companies to hold onto their war chest will increase markedly. Apple, for one, will need to invest to meet a major challenge. No matter how many iPads and iPhones it sells in 2011, the competitive focus is shifting to the “ecosystem.” This comprises not just computing devices and software, but also “services,” which basically means content and functionality that is hosted on Apple’s own computers in its data centers. Apple is already the No. 1 online music vendor in the world, serving up content from iTunes. That’s a start. But it will have to show it can go head-to-head with Google, which has spent many more years hosting individuals’ data and thinking about the Internet, not desktop applications. In response, Apple is investing $1 billion in a data center in North Carolina and it is widely expected that the facility will enhance Apple’s current MobileMe online application. It could, for example, become a big jukebox in the sky, where a customer’s movies and music are stored permanently, rather than residing on their Mac computer. APPLE IS CERTAINLY GEARING UP for big investments. Its capital expenditures are expected to jump more than 55% this year, to $4 billion, according to Caris & Co.’s Robert Cihra, mainly for online infrastructure. The cloud is tech-industry argot for collections of server computers managed by service providers, rather than maintained by the individual. The big question is, Why? Why not just sell computers and smartphones? Why become a “services” company? One answer is lock-in. Apple and Google know that by holding your data in the cloud, so to speak, they’ll retain your loyalty for their software and devices. The defection of customers to other vendors will decrease, or so the thinking goes. Another answer: 2011 will bring more and more pressure on tech companies to compete with the new kids on the block. Facebook, whose founder Mark Zuckerberg is Time’s Person of the Year at the tender age of 26, is apparently valued these days at approximately $55 billion, based on recent private investments in the company. Twitter is approaching $4 billion in market cap. And still another answer is that Apple and Google and others are under pressure to keep innovating or fall behind. Screenshot of Apple’s homepage. I have no idea what this is about. Zilch. UPDATE 1: The question to keep in mind if you’re guessing what this about is, “What could Apple announce without a media event to explain and demo it?” Best guess I’ve heard so far: it’s just iOS 4.2, and the reason it says “from iTunes” is because iTunes (the app) is where you go to get the update. Apple wants everyone, especially iPad owners, to get this update. But that’s just a guess. Second guess: additional content deals for TV show rentals. Admittedly, neither of these seem like something we’ll “never forget”. UPDATE 2: A couple of readers are guessing “Beatles”, arguing that the clock faces vaguely resemble the album cover for “Help”. No on-stage performance from Paul and Ringo, though? Maybe Yoko insisted on singing. ▪ Music streaming service, based on Lala acquisition. Possible, but I doubt it. I think they’d have an event for that, and as Peter Kafka writes, there have been no leaks from the music industry about such a deal. Apple can keep its mouth shut, but the music labels can’t. ▪ Cloud-based backup/streaming of purchased content. Possible, but I think this is the sort of thing they’d demo and explain at a media event. ▪ A digital “newsstand”, for subscription-based delivery of newspapers and magazines to iOS devices. No way — again, that’s the sort of thing they’d demo and explain at a media event. In short, major new Apple products are unveiled at events. A major new content deal is the sort of thing Apple might announce without an event. UPDATE: My inbox is filling up with emails along the lines of, “Sure, The Beatles are great, maybe even the best, but they’re still just one group. Why would Apple make such a big deal out of this?” Mike Davidson explains. Did Steve Jobs friend, er ping, Mark Zuckerberg? Apparently Jobs invited Zuckerberg for dinner at his house to talk about Ping two weeks ago. That’s when a tipster spotted them on a stroll in Palo Alto. This is the best encounter since Google CEO Eric Schmidt had coffee with Jobs back in March. Ping is Apple’s music social networking service that it recently launched. Before the launch, the iTunes team was in talks with Facebook for 18 months or more. Apple wanted to build Ping as a music tracking and sales service on top of Facebook, which could have turbocharged iTunes and iPod sales without Apple having to build its own social network from scratch. But Jobs told Boomtown’s Kara Swisher that Facebook’s terms were too onerous. Apple tried to install Facebook’s Connect service without a deal and Facebook blocked it. The relationship, which began on such friendly terms years ago when Apple was Facebook’s first big commercial sponsor through its Apple Students group, has gotten complicated now that Facebook has asserted itself as one of Silicon Valley’s major players. But there would be friendship with significant benefits for both parties if Apple and Facebook could strike a deal. Facebook’s chief technology officer Bret Taylor thinks the two will work things out. I just love watching what smart people come up with. The latest is an algorithm to figure out when Apple will reach its 10 billionth song downloaded. Barry Schwartz, Mike Butler and Alex Fierro came up with a way to predict when the company will reach the milestone. According to Schwartz, this is how they figured things out. You can see the counter on his Web site. The counter is down to 83 million and dropping. The estimated time to reach 10 billion is in 7 days, 11 hours. Apple is holding a contest with a $10,000 gift card going to the person that downloads the 10 billionth song.